The previously teased Pokémon title that was shortly set for a reveal has now been announced, currently on show at Japan’s Jump Festa event. In an unlikely pairing, The Pokémon Company and Tecmo Koei are to team up for a crossover for their respective Pokémon and Ambition of Nobunaga franchises. 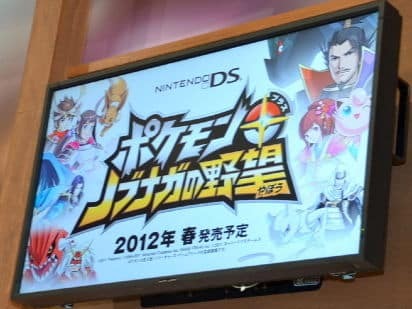 It’ll be co-produced by the two companies and titled under the unimaginative ‘Pokémon X Nobunaga’s Ambition’, due to release in Japan for Nintendo DS during Spring 2012. From early screenshots, it would appear that the game will pair Pokémon with trainers based upon historical Asian generals. We’ll keep you posted as we learn more!